Become the master of your hormones to live a vibrant life of power and possibility. Naturopath Frances Michaelson will teach you the steps to build your hormonal health. She will explain how lifestyle intervention, a healthy diet, exercise, sleep and managing stress all play significant roles towards the endocrine system. Understanding how our bodies work from a cellular level will help guide you to making better choices for maintaining homeostasis, amplifying the vitality of your physical systems. Yoga and meditation teacher, Erica Arsenault will empower you to devote yourself to a daily practice of movement and stillness. She will explain the chakras related to the endocrine system and how to stimulate oxygenated blood flow to the glands, increasing the secretions of hormones and neurotransmitters as well as increasing ethereal energy to create pressure around the gland, ultimately promoting vitality and health. You hold the agency to restore balance and reduce production of cortisol and adrenaline when devoted to a daily practice. 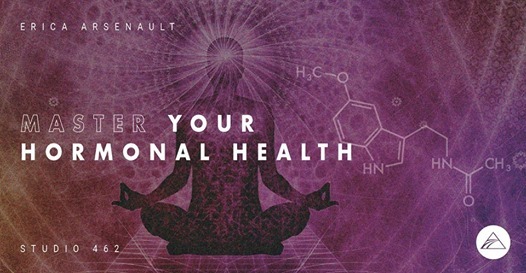 You will leave the workshop with a daily movement sequence, a breathing technique and a mediation to alter the endocrine system, amplifying your emotional wellbeing.